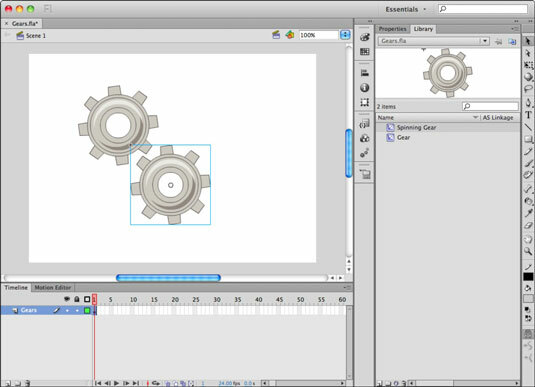 Movie clips in Adobe Flash CS6 are created as new, empty symbols as well as from existing content on the stage. 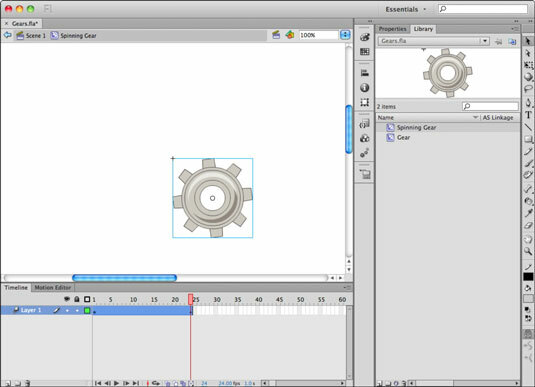 If you create a movie clip from scratch, you can add animation and graphics later by editing the symbol. Create some interesting graphics on the stage by using the drawing tools. Select the new artwork and choose Modify→Convert to Symbol. Enter a name for your new movie clip in the Name text box, select Movie Clip from the Type drop-down list, select a Folder (if it’s other than the main Library root), and click OK. The artwork now appears as a movie clip on the stage. Choose Window→Library to check out your new symbol in the library with a special Movie Clip icon next to it. Nonanimated graphics converted to movie clips behave the same as graphic symbols, so you can place, tween, and modify instances on the stage. The difference, however, is that you can always add animated content later to the movie clip by editing it and creating tweens on its own Timeline. In most cases, you take full advantage of movie clips by adding animation in a new movie clip symbol. To do so, you can start with a new, empty movie clip symbol and add the animated content afterward. Enter a name for the movie clip in the Name text box, select Movie Clip from the Type drop-down list, choose a folder (if it’s other than the Library root) to sort the new symbol into and click OK to create the new symbol. You see a new timeline, and the symbol is ready for you to add animation. This Timeline works just like the main one: You can add and reorder layers and create tweens. You still need to convert any artwork to graphic symbols before creating motion tweens. Create some new graphics on Frame 1 of the existing layer 1, select the graphics, choose Modify→Convert to Symbol, name the symbol and select Graphic from the Type drop-down list, and then click OK.
Right-click Frame 1 and choose Create Motion Tween to create a new tween span on the layer; click and drag the last frame of the tween span to shorten it to 24 frames (only if the span is greater than 24 frames). 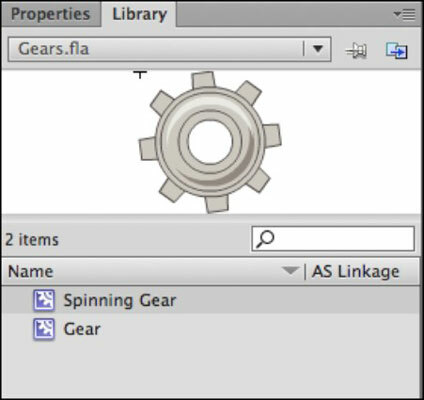 On Frame 24, change the position or rotation of your symbol to set it in motion. Press Enter or Return to preview the new Movieclip Timeline and make sure your animation plays back properly. Click the Scene 1 link above the stage to return to the main Timeline. Locate your new movie clip symbol in the Library panel and drag two instances of it to the stage. If you press Enter or Return to watch your movie clip play on the stage, you’ll probably be a little disappointed. Don’t worry: To see your movie clip in action, you just need to preview the movie in Flash Player.